Some of the best resources are the state archives and this is true for the state of New York. This former British colony and then one of the original 13 states, it has a very long history with a variety of people calling New York home. A large part of the archives collection is in digital format and can be viewed online for free. The is a search box in the upper right corner. There are actually many different types of items that have been made digital. This includes photos, documents, maps, records, manuscripts, and artifacts. Place a key words, name, location in the search and those that fit will appear. You can also go through the ‘browse the collections‘ section to get a better idea of what is available. Each image can be enlarged by clicking on it. The image can be saved to your computer. It will take some searching to go through the vast collections, but you never know what might be found. 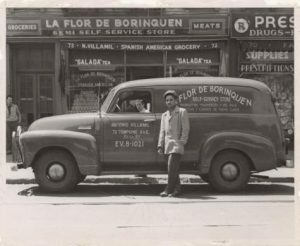 Photos: La Flor de Borinquen bodega, a local grocery store catering to ethnic tastes in Brooklyn; and Aerial of Manhattan in 1950s.